Hoooooo boy I’ve got a lot of blog entries to catch up on. 2016 has been a busy year! 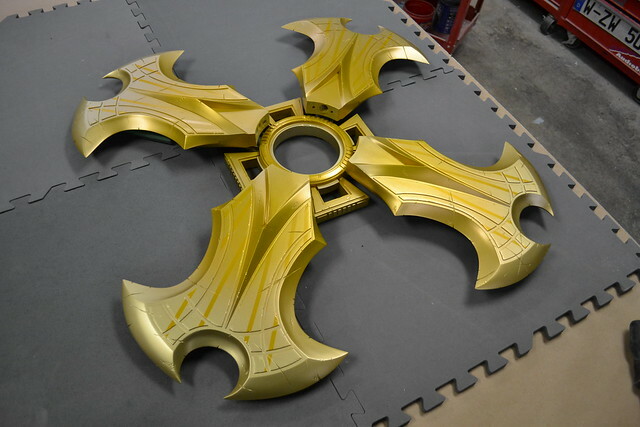 Sivir’s Chakram overlapped the end of 2015, and debuted at PAX East 2016 alongside two other pieces I built for the guys at Riot Games as part of their “Riftwalk” experience. 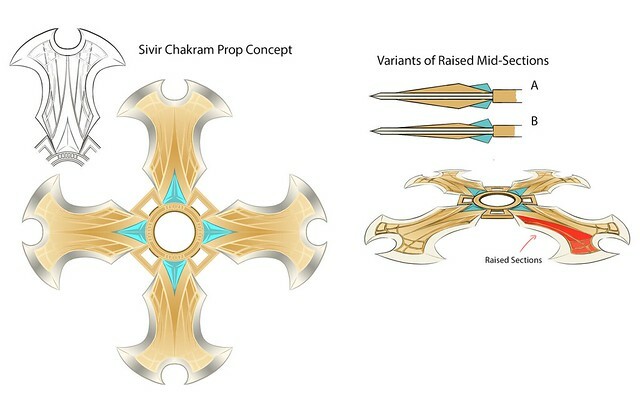 Most of the League assets are kind of smallish, so a fair bit of concept illustration was needed to nail down the designs before they could be brought into the real world. 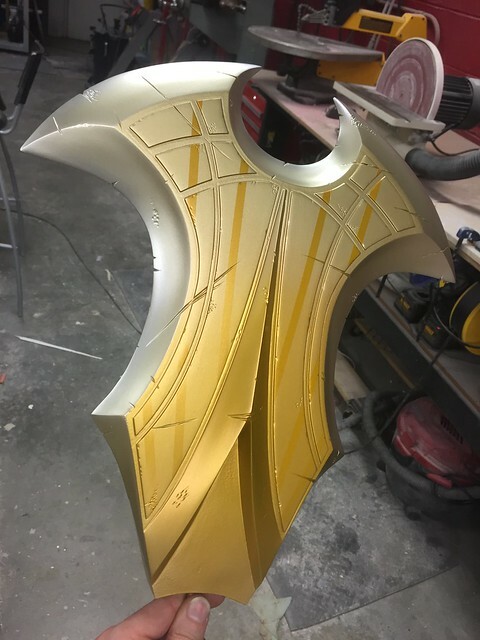 My friend Tom Weiser took care of refining the blade elements and sun ray design into the final shape I ended up building. 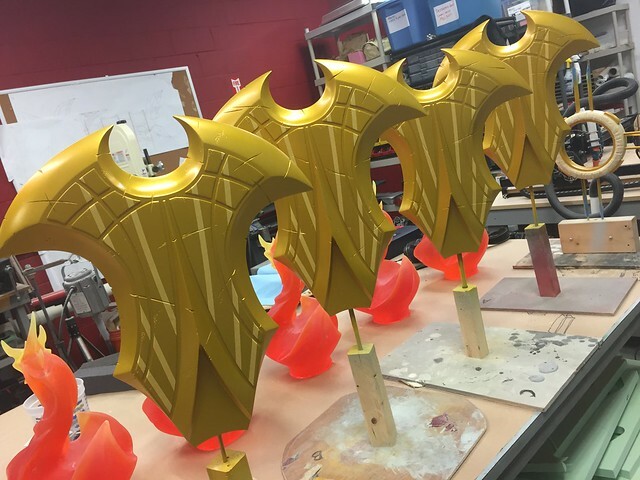 Since I’d be essentially copying one element four times, the plan was to make one blade section and one handle, then mold these sculpts to create four castings. 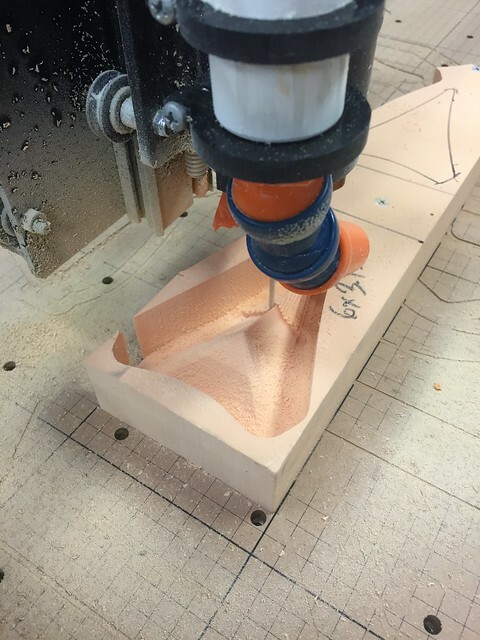 The low, wide blade sections were ideal for my new Inventables X-Carve CnC mill! 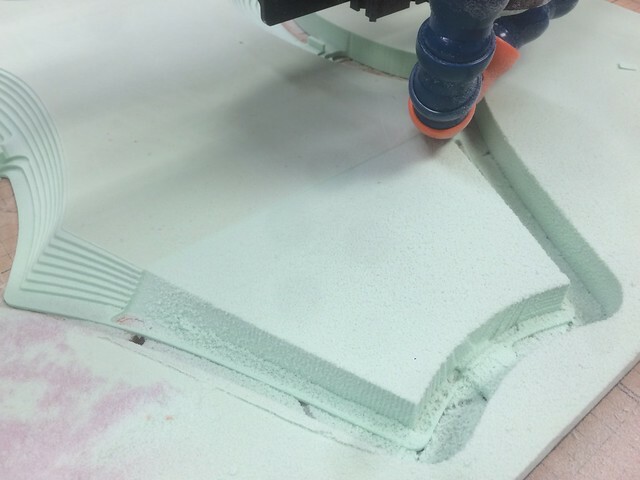 Blade sections were milled out of 18# tooling board. 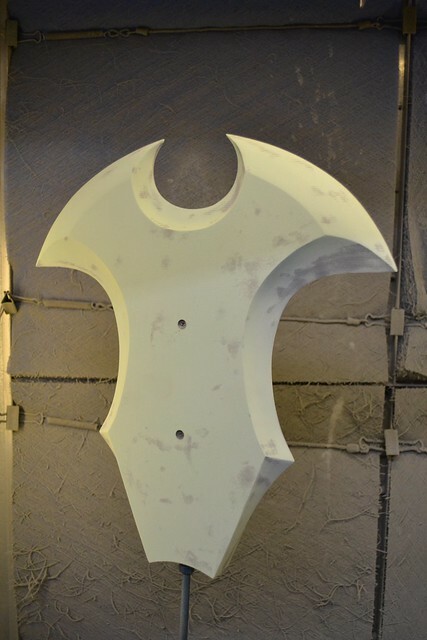 The blade halves were glued together with SmoothCast 320 casting resin then primed with 2k urethane primer. 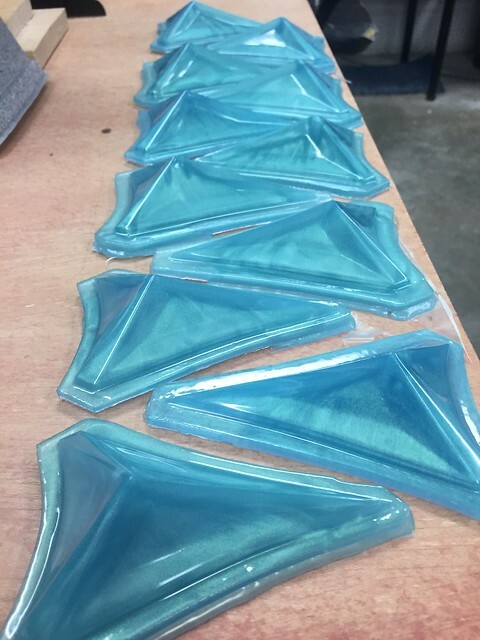 The narrow peak around the gems was also milled from urethane tooling board. 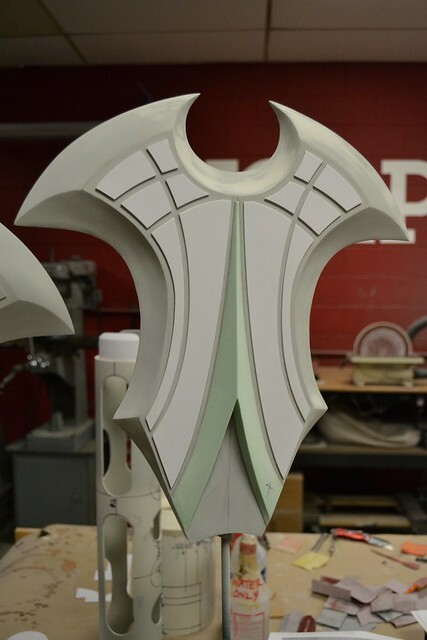 This joined a handful of laser cut styrene elements to create the raised items on the blade face. 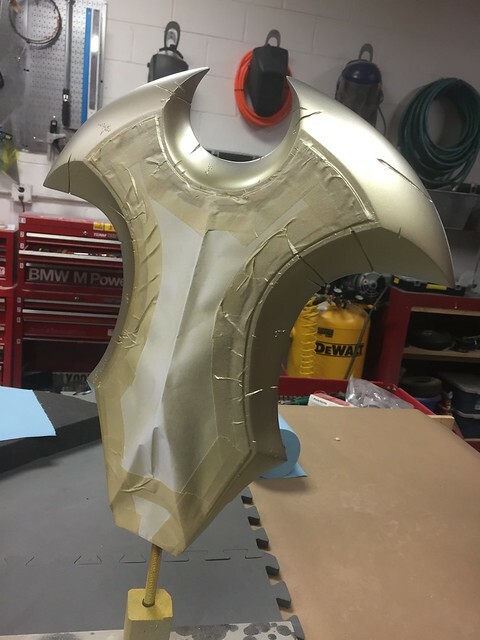 Several rounds of primer and spot putty followed until the blade section was perfect and ready for molding. 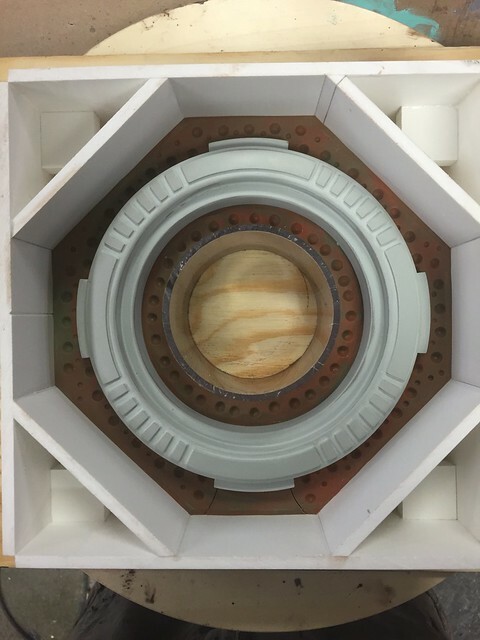 The mill was fired up for the center ring as well. This section was cut from 31# tooling board, which was a bit of a struggle for my milling machine but it persevered in the end! 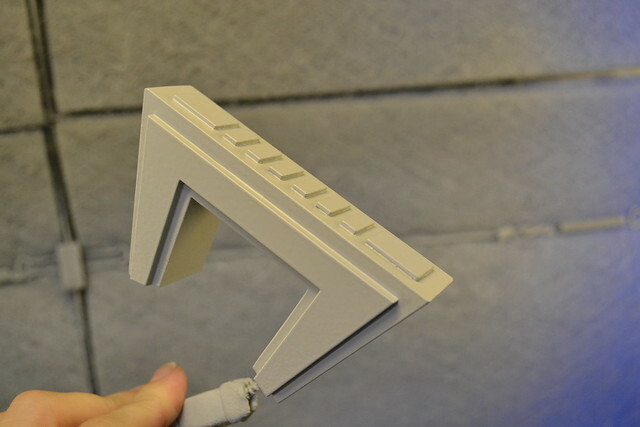 None of these parts are perfect right off the machine – on the left is a sanded part and the piece on the right hasn’t been cleaned up at all. 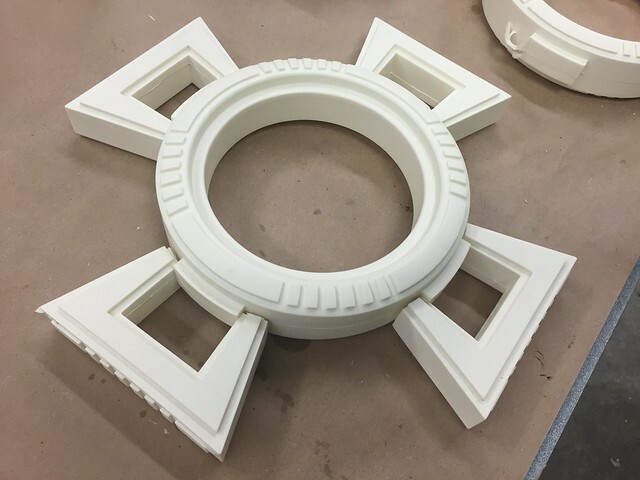 A few bits of sintra were added to mark the quarters where blades would attach, then this piece was primed in prep for moldmaking. 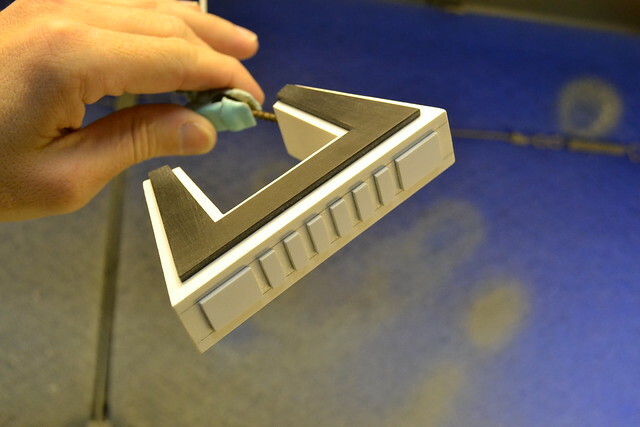 The ridiculously tiny handles were constructed from layered sintra and acrylic. 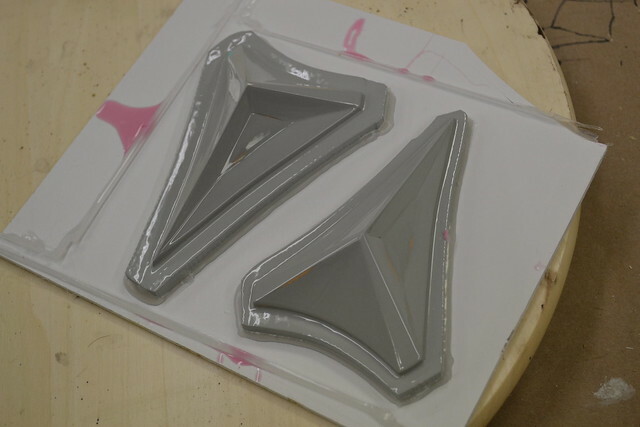 These needed four copies so they followed the same pattern we’ve established already: primer in prep for molding. First, the easy stuff. 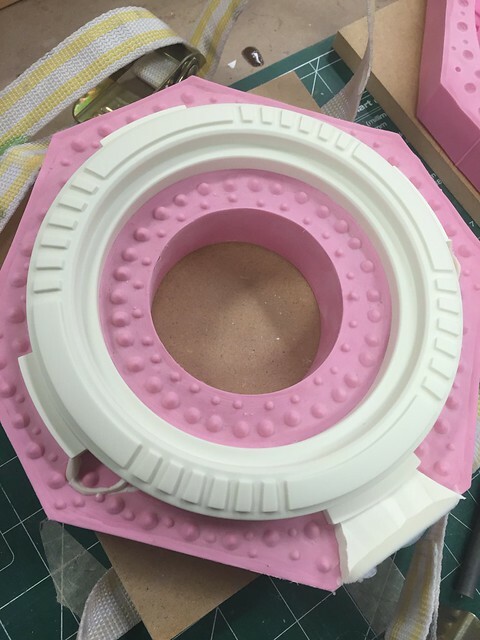 Handles and the center ring were block molded with Smooth-On’s Mold Max 30. The handle had a large plug installed in the center to try to save on material cost a bit. 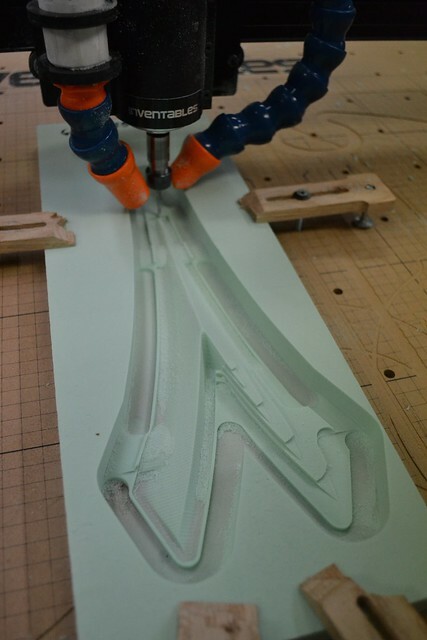 Castings were simple SmoothCast 320 pours, pressure cast to reduce any trapped air bubbles. 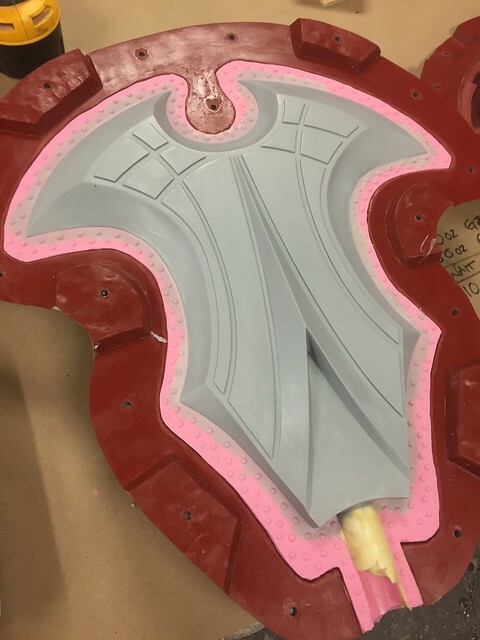 The blade needed something a bit more complex; in order to save weight the castings would be a thin epoxy shell back filled with expanding foam. 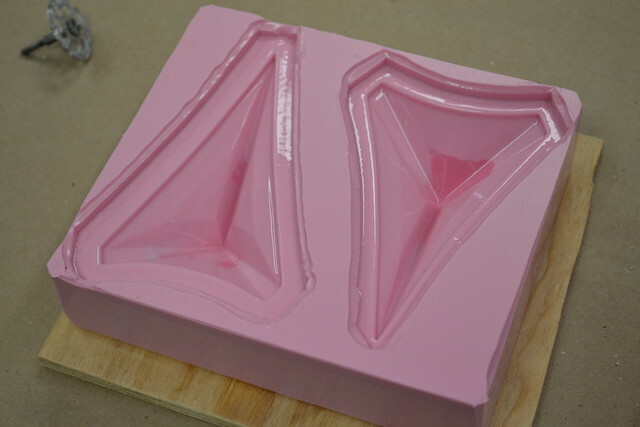 Only a matrix mold would be able to hold the pressure of the foam without distorting. 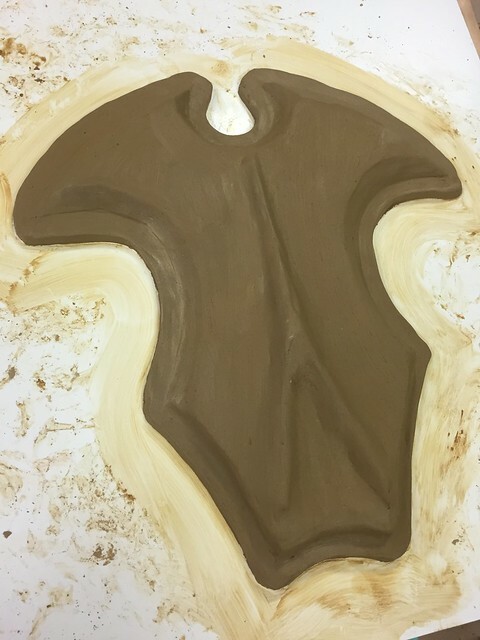 I started by wrapping the master sculpt in a polypropolene bag (commonly referred to as a “dry cleaning bag”) then began sculpting lizella water clay in shape I wanted the silicone to take. 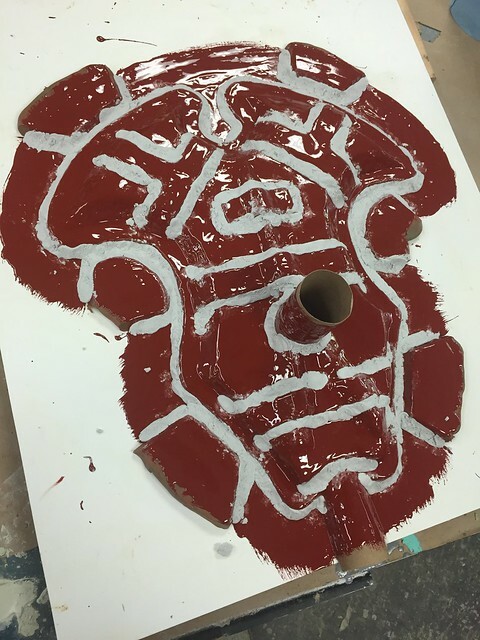 Registration lines were added to the surface of the clay, followed by mold jacket keys along the outer perimeter. 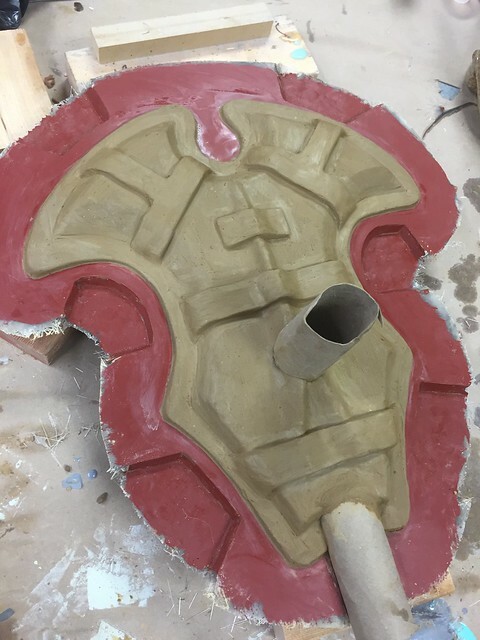 A cardboard tube placed in the center will act as the silicone pour spout later, and another at the base will allow resin and foam to be poured into the silicone mold. 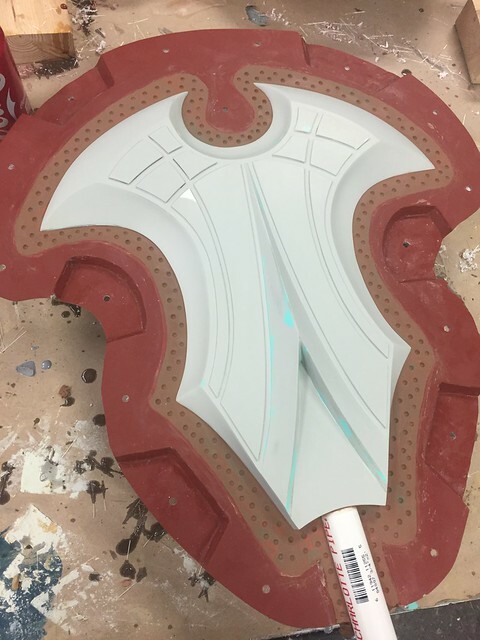 The first coat of resin used was Smooth-On EpoxAcoat Red. 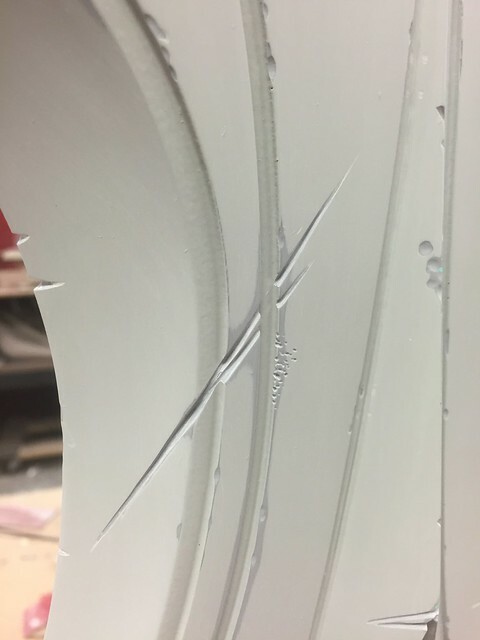 Once the epoxy was dry enough to be just slightly tacky, Free Form Air was pressed into any sharp edges and corners to smooth out the surface of the print coat. 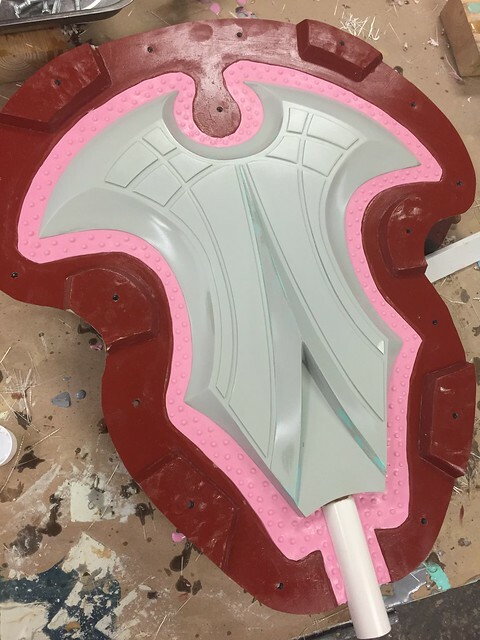 This was followed by several layers of EpoxAmite 102 and glass fiber cloth to build up thickness and strength. 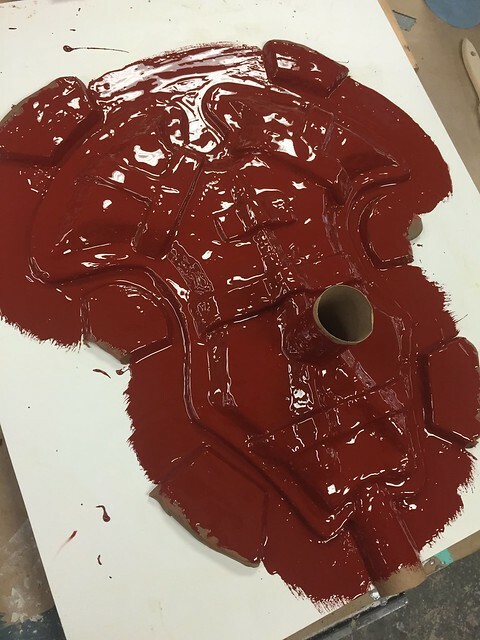 After one half cures, the mold was flipped over and the whole process repeated. 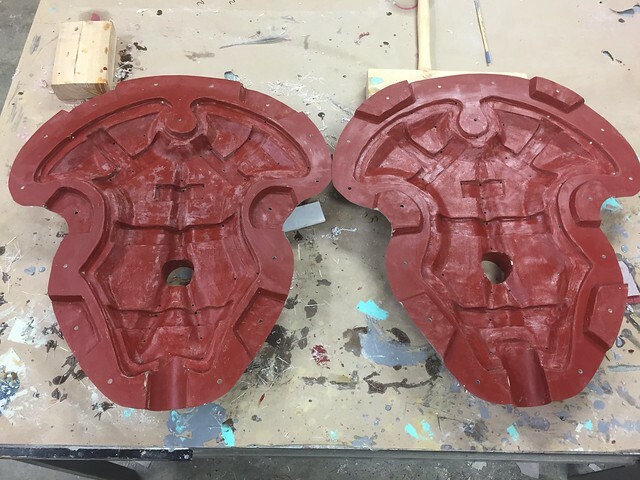 Here are the two finished mold jacket halves, ready for the mold master and silicone. 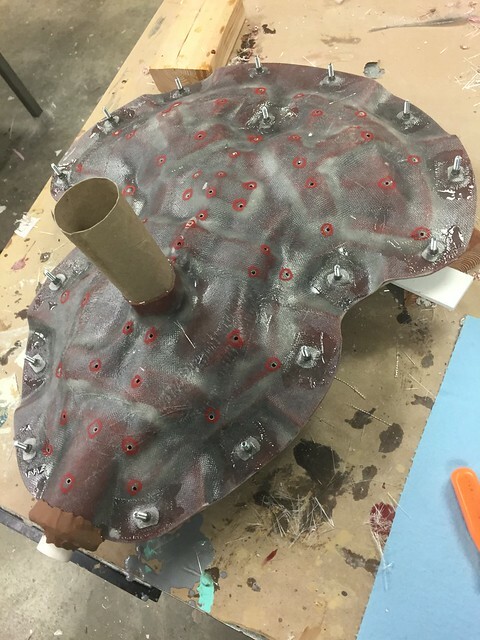 A parting seam was created with Van Aken plastalina non sulfur oil clay, then the mold jacket was reinstalled and filled with silicone. 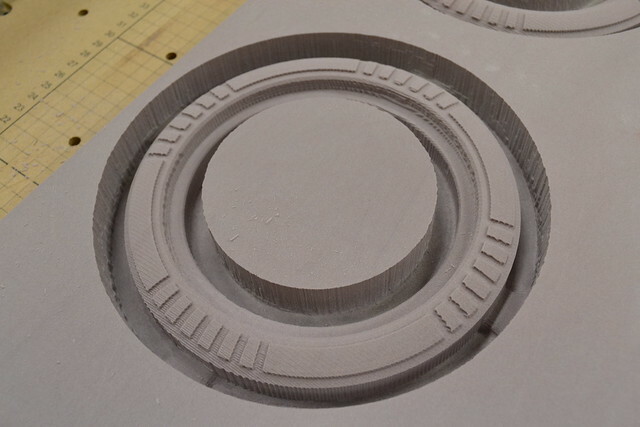 I used more Mold Max 30 for the rubber in this mold. 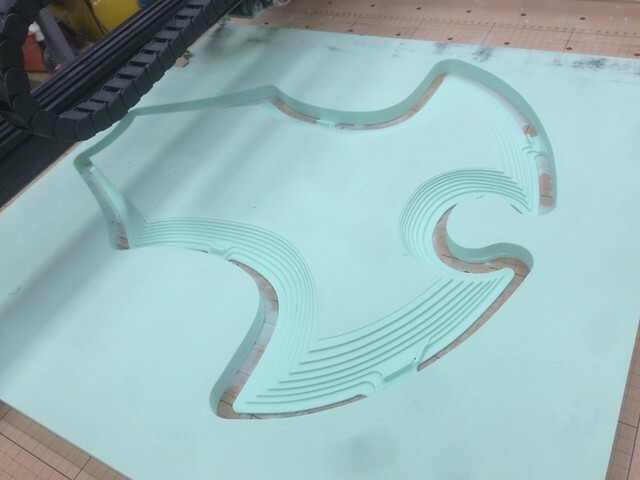 After 24 hours the first silicone half was cured. 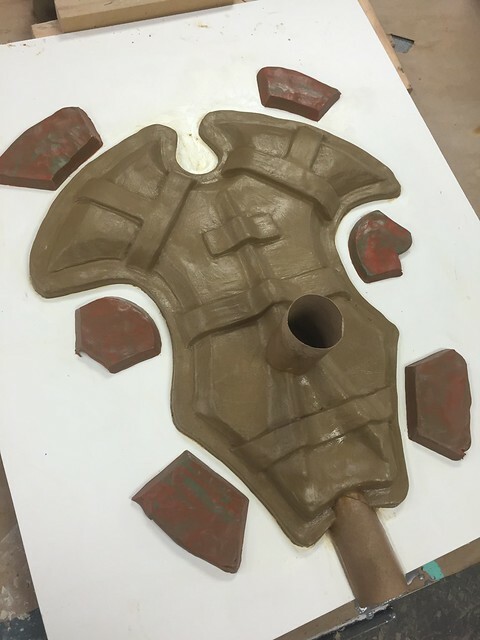 The mold was opened and the oil clay removed. 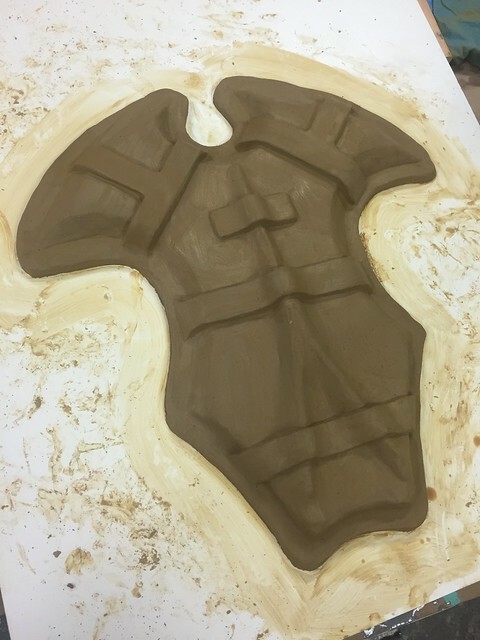 Once the silicone and mold master were sprayed with mold release, the jacket was bolted back into place and the second half of the mold was poured. Everyone still with me? Good. Bam! 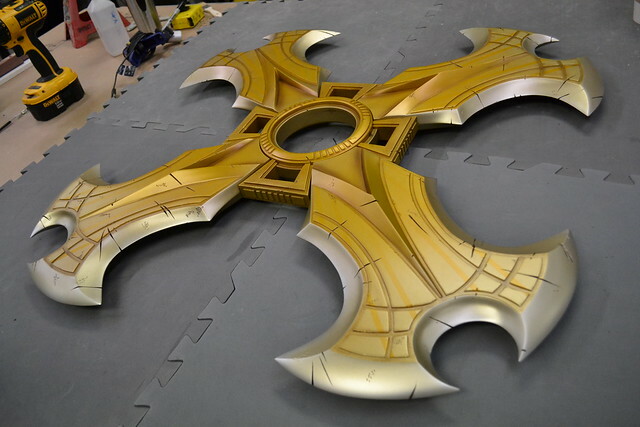 Finished Chakram blade mold. 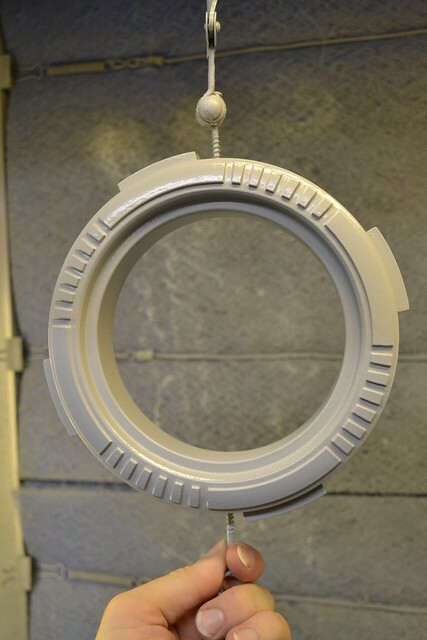 Castings were created by brushing Smooth-On EpoxAcoat Gray into the open mold halves. 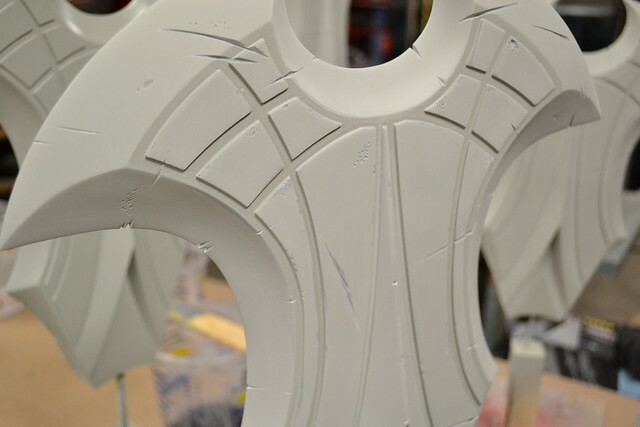 This was done in two passes, and the second brush coat slightly overlapped the seam line. 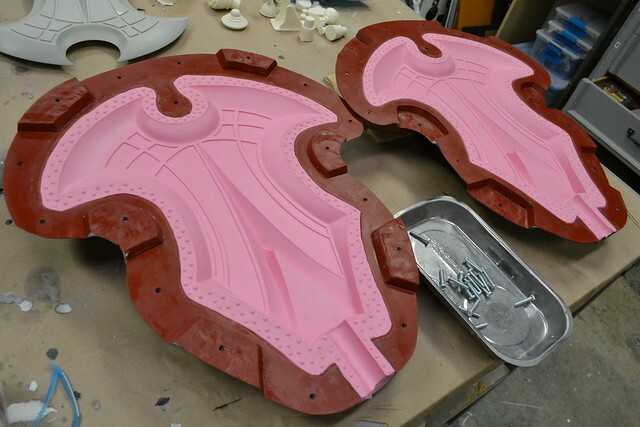 When the mold was reassembled, this material would glue the two halves together and create a rigid, hollow casting. 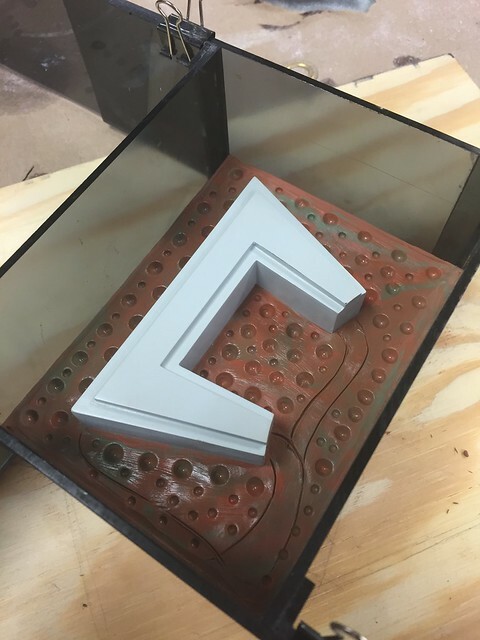 After the epoxy cured for 3 hours, Foam-It 10 was poured into the open interior cavity. 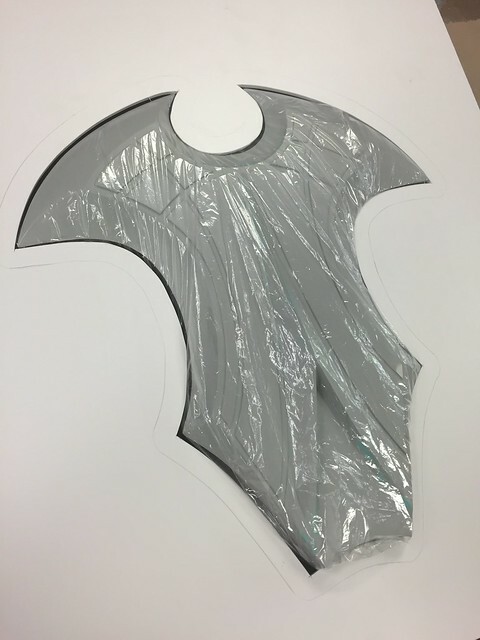 This would give the blades added strength without adding too much weight. 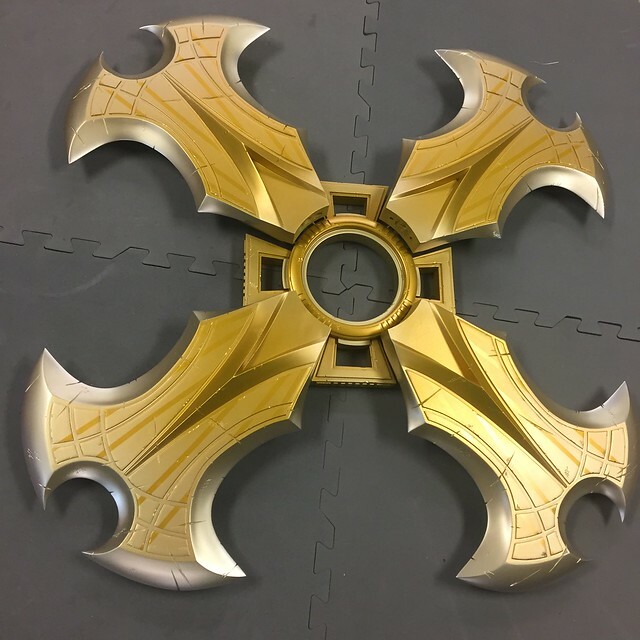 Repeat three more times, and there’s one Chakram! 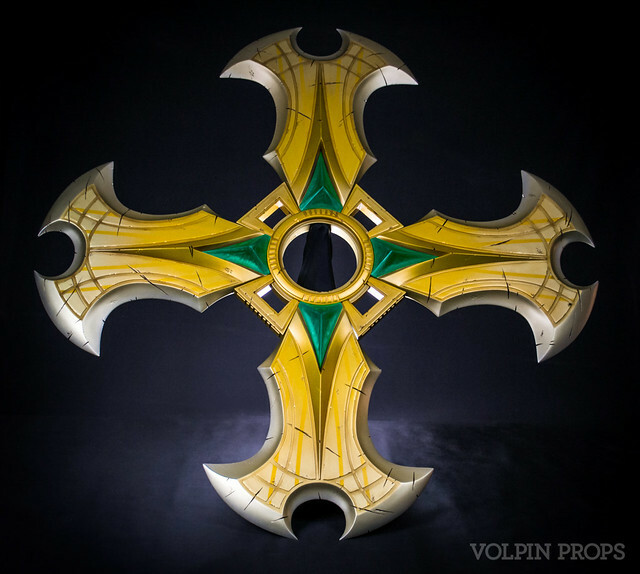 Each blade section mounted to two 14″ long, 3/8″ diameter steel bars embedded into the center ring. These made sure everything was on a level plane and sturdy. 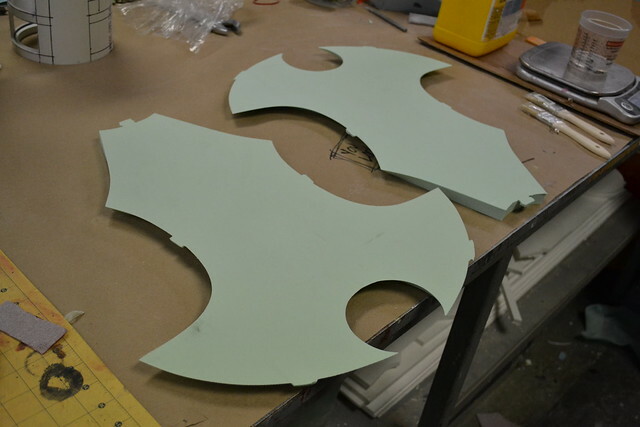 The epoxy casting process left several small voids in each blade. 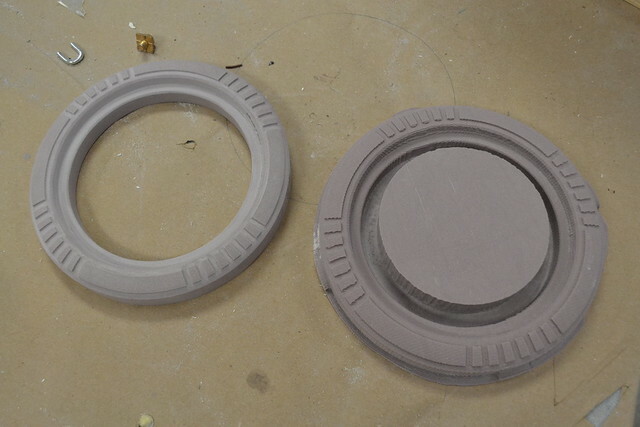 These were filled with spot putty and sanded flush. …of course, then I had to go and wreck up the place a bit. 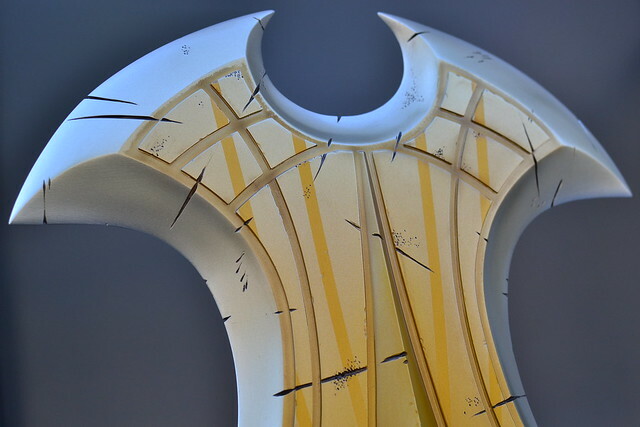 Each blade was treated to a series of cuts, gouges, nicks and stippling to simulate damage and wear. 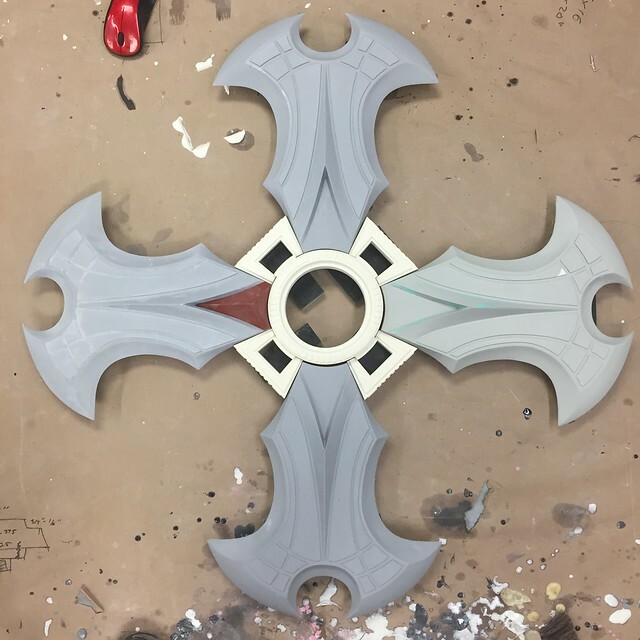 This part of the process was really very fun, though it was tricky to make the damage unique across each blade section. 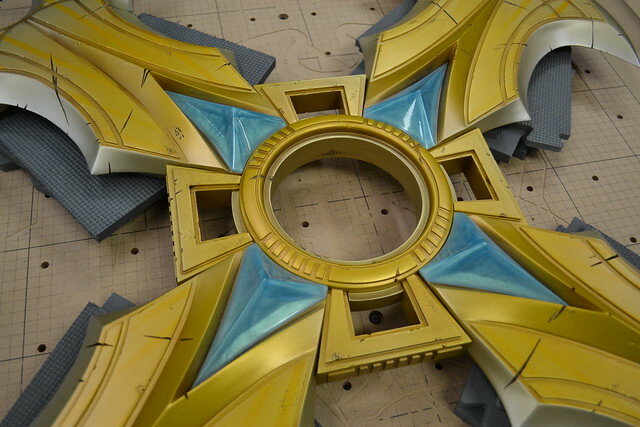 Sun rays were then masked off on the raised blade sections using Tamiya masking tape. 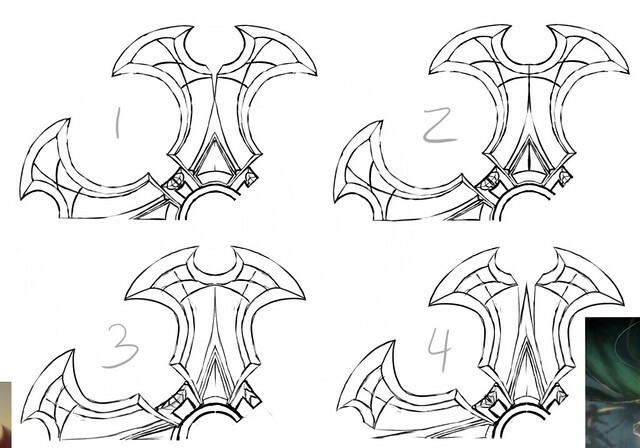 I made a set of paper templates to make sure each blade was treated identically. 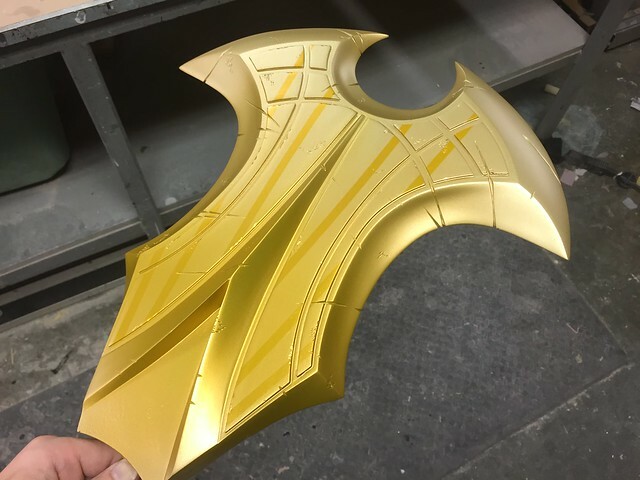 A gradient was applied over the masked off blade with more Shimrin paint, this time in “Zenith Gold” which has a more silver tone. 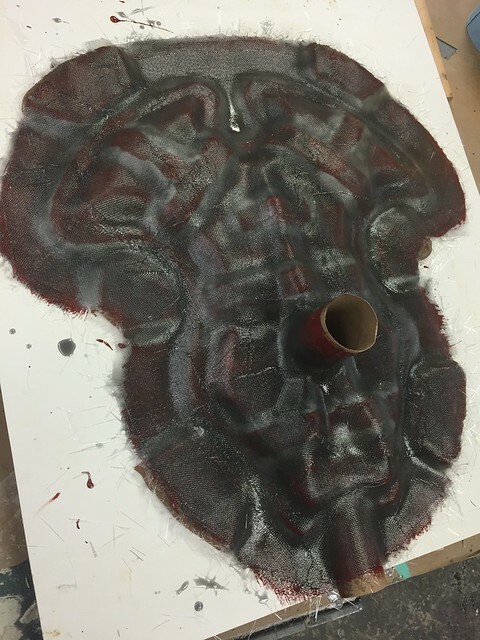 After removing the masking tape, the effect was really amazing. But wait! 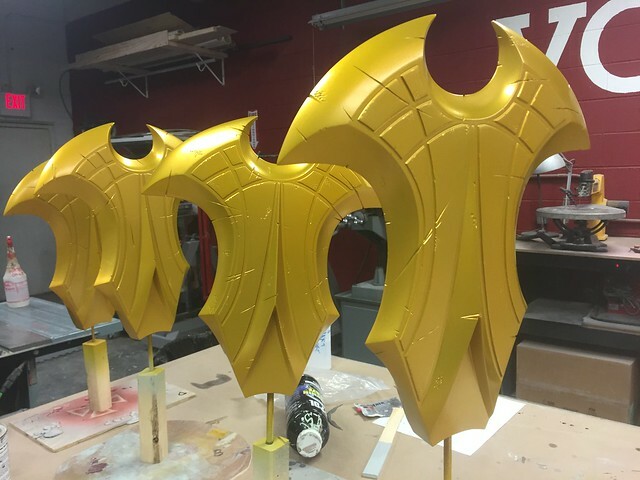 There’s more masking left! 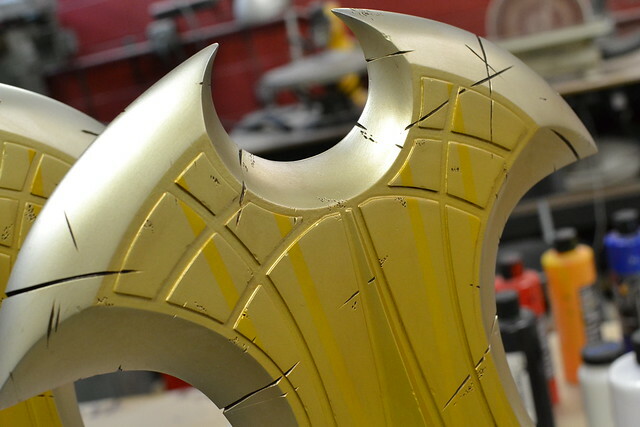 The blade edges were then taped off and painted with Shimrin “Orion Silver” to give them a bright profile. 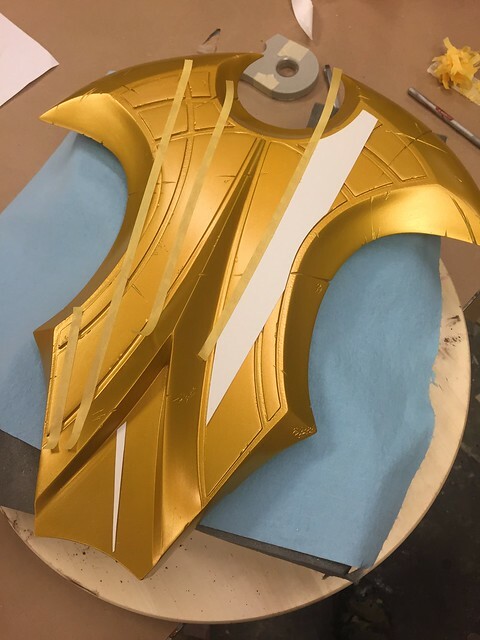 With the colors complete, the damaged sections were given a brown wash and seam lines accentuated with a little airbrush shading. 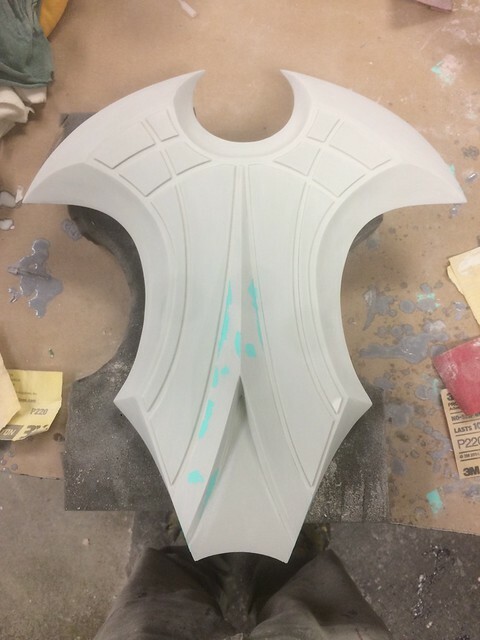 A coat of matte 2k urethane clearcoat was then applied to protect my week-long paintjob. 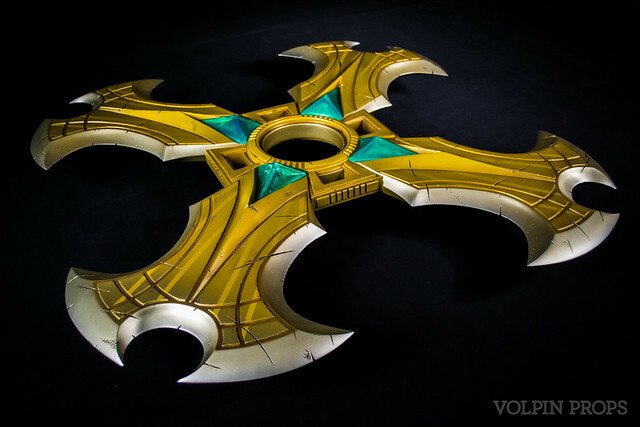 The clamp job to assemble the Chakram was really quite aesthetically pleasing. I was lucky my long clamps could reach the required length! 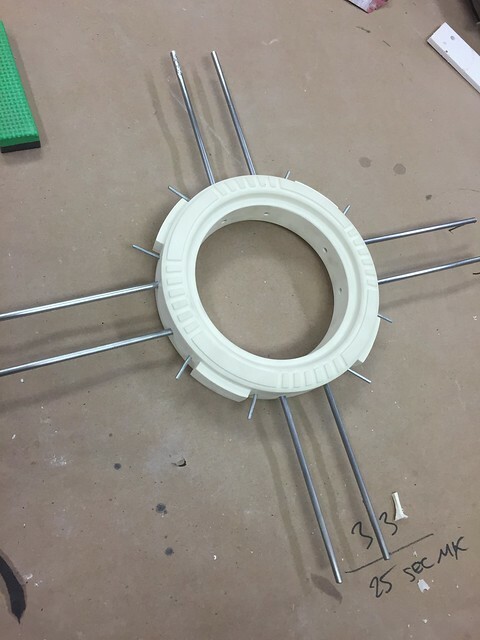 Each section was glued in place using Plexus MA300 methacrylate adhesive. One last piece remained: the gems! 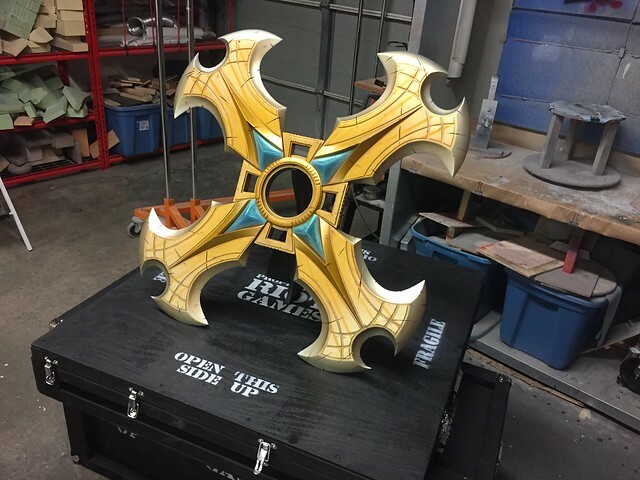 This was left to last because I was worried that there may be some shrink in the overall size from the master to mold to cast copies of the blades. 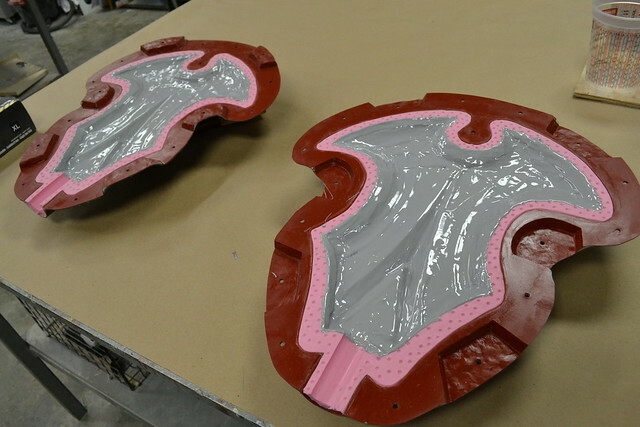 Two masters of the gems were milled from 18# tooling board, then primed/sanded and clearcoated before molding. The gems were cast with SmoothCast 325 and pearl powders to give them their swirly marbled appearance. 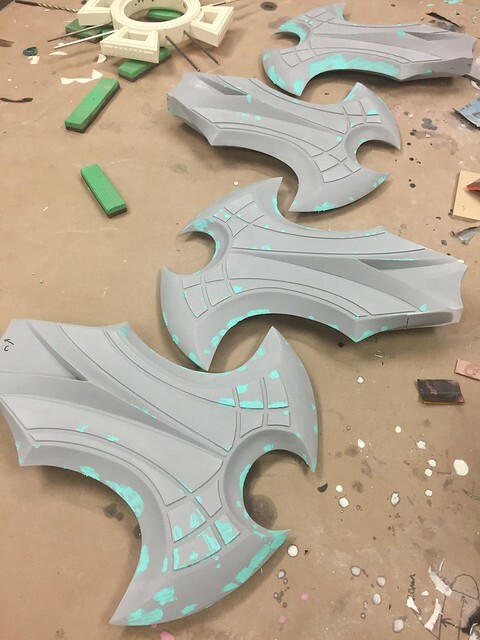 Initially these were cast in blue, but later swapped out for a deeper green. More MA300 was used to keep them in place until time stops. I also put together a road case for transporting this monster. 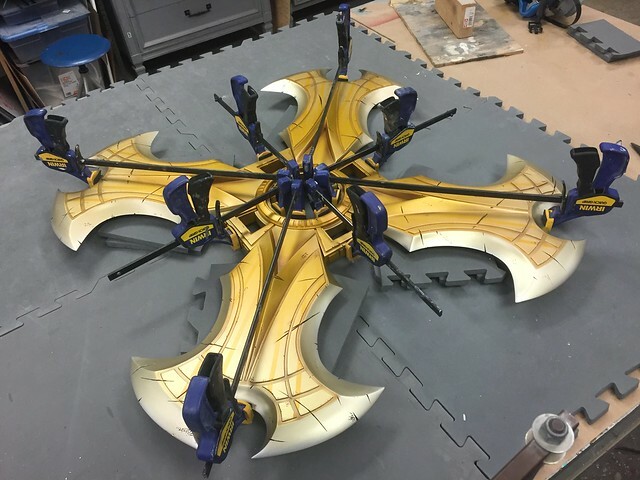 It’s 36″ in diameter but weighs less than 10lbs! 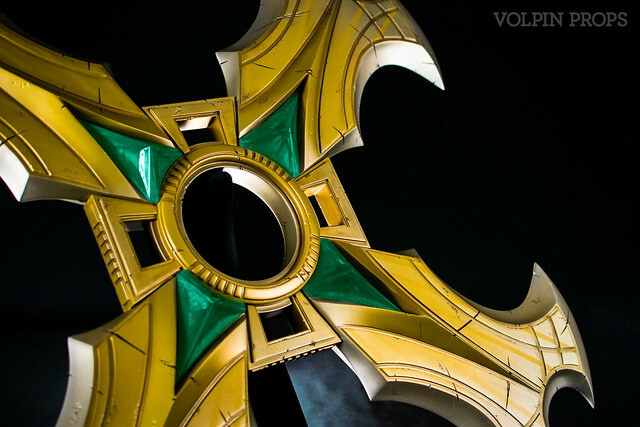 Here’s some finished photos, check out the portfolio gallery for more. 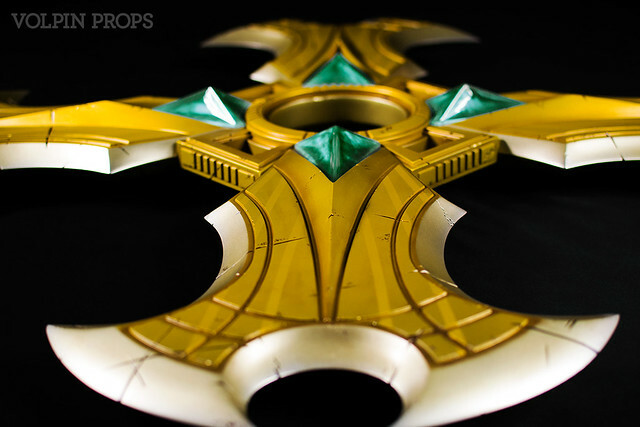 If you’re interested in even more progress photos, be sure to check out my flickr!